Like couscous salads? This one is just about perfect. It's an easy vegetarian and vegan couscous salad recipe bursting with chickpeas, green onions, tomatoes and cucumbers in a light lemon Dijon dressing topped off with chopped fresh parsley. It's perfect as a side dish to accompany anything you're putting on the grill, or, it makes a nice and light healthy vegetarian lunch. Along with the more traditional pasta salads and bean salads, a couscous salad is always a good choice to bring to a spring or summer vegetarian or vegan potluck or picnic if you need ideas. 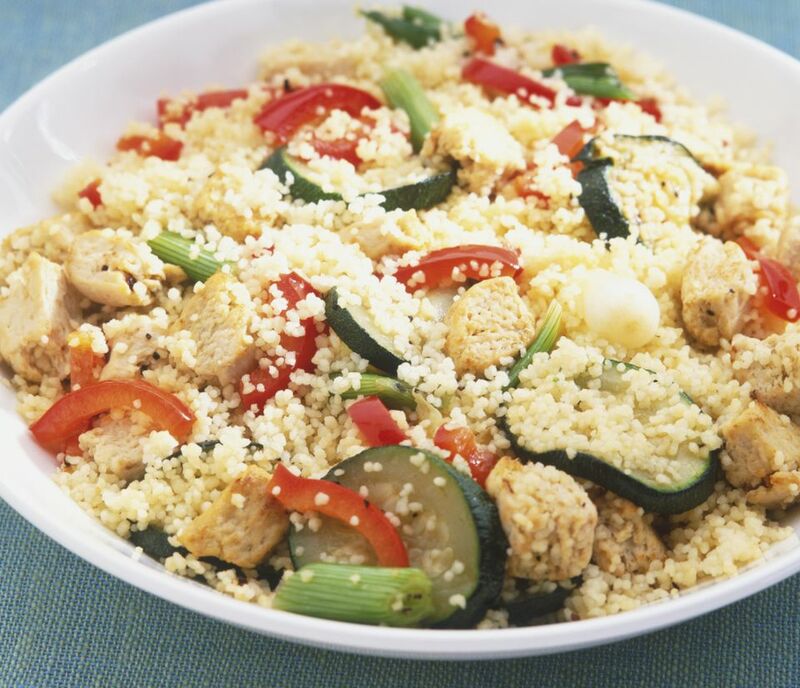 This simple and easy vegetarian couscous salad recipe is courtesy of Fantastic Foods. Cook the couscous according to the package instructions. Couscous cooks very quickly, so this should take you less than ten minutes total. Quick tip: Cook your couscous in vegetable broth instead of water to maximize the flavor. Set your couscous aside and allow it to cool slightly before proceeding. It doesn't need to be completely cooled. That is, it's ok if it's still warm, but it shouldn't still be steaming hot. Combine the cooked and cooled couscous, the chopped green onions, tomatoes, cucumber, chickpeas and fresh chopped parsley in a large bowl. In a separate small bowl, whisk or blend together the olive oil, lemon juice, garlic, Dijon mustard, coriander, and salt. Pour this dressing over the couscous, tossing gently to coat. Looking for more ideas for what to bring to a vegetarian or vegan potluck or picnic? Most people will bring a traditional dish like a vegetarian pasta salad or a vegetarian potato salad and there will likely be plenty of bean salads too. Just about any vegan dessert will always be welcome, and, the last vegan potluck I went to, I brought vegan spring rolls and they were gone in a flash (in hindsight, I should have made a double batch! ).